PACA 1505 State St. Sept. 25 8 p.m.
PACA continues its exciting practice of bring top-level adventurous musical groups to Erie! 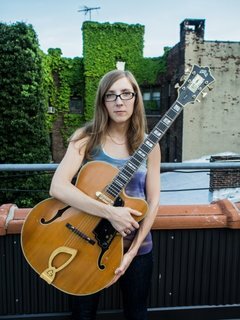 On Sunday, Sept. 25 at 8:00 p.m. PACA will present bassist Stephan Crump and guitarist Mary Halvorson. Admission donation will be $10, but addition donations will be welcome. 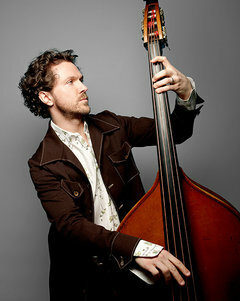 Halvorson has become a leading figure on the international avant garde jazz scene. She and Crump have been performing as a duo since 2011 and recently released the album "Super 8" (Inrakt Records, 2013.) Get a taste of their open-ended ideas in a performance at the Cornelia St. Cafe in New York City (below). After three years of study with visionary composer and saxophonist Anthony Braxton, Ms. Halvorson became an active member of several of his bands, including his trio, septet and 12+1tet. To date, she appears on six of Mr. Braxton’s recordings. Ms. Halvorson has also performed alongside iconic guitarist Marc Ribot, in his bands Sun Ship and The Young Philadelphians, and with the bassist Trevor Dunn in his Trio-Convulsant. Over the past decade she has worked with such diverse bandleaders as Tim Berne, Taylor Ho Bynum, Tomas Fujiwara, Ingrid Laubrock, Myra Melford, Jason Moran, Joe Morris, Tom Rainey and Mike Reed. As a bandleader and composer, one of Ms. Halvorson’s primary outlets is her longstanding trio, featuring bassist John Hébert and drummer Ches Smith. Since their 2008 debut album, Dragon’s Head, the band has been recognized as a rising star jazz band by Downbeat Magazine for five consecutive years. Ms. Halvorson’s quintet, which adds trumpeter Jonathan Finlayson and alto saxophonist Jon Irabagon to the trio, has released two critically acclaimed albums on the Firehouse 12 label: Saturn Sings and Bending Bridges. Most recently she has added two additional band members—tenor saxophonist Ingrid Laubrock and trombonist Jacob Garchik—to form a septet, featured on her 2013 release Illusionary Sea. Ms. Halvorson also co-leads a longstanding chamber-jazz duo with violist Jessica Pavone, the avant-rock band People and the collective ensembles Thumbscrew and Secret Keeper. Crump's mother is from Paris, his father, an architect and a jazz drummer from Memphis, where Stephan Crump grew. He first learned classical piano and saxophone before he played as a young bass guitar, appeared at festivals in the southeastern United States and a jazz rock trio belonged, for which he composed. The Bachelor of Music he acquired at Amherst College , where he studied with the composer Lewis Spratlin studied with Max Roach , Frank Foster and Ray Drummond worked. During this time he switched to bass and spent a year abroad in Paris. Upon completion of college, he toured with the Tommy Dorsey Orchestra ( Ghost band ); then he moved to New York and continued his studies with Michael Moore continued. Crump worked since the 1990s in the New York music scene, u. A. With jazz musicians such as Dave Liebman , Billy Hart , Sonny Fortune , Greg Osby , Kenny Werner , Bobby Previte , the Blues veterans Johnny Copeland and singer-songwriters , including Ashford and Simpson , Michael McDonald , Patti Austin , Jorma Kaukonen and Lucy Kaplansky . Crump is since 1997 member of the trio of pianist Vijay Iyer and forwards the Rosetta Trio (with Liberty Ellman and Jamie Fox ), with which he presented a series of albums. 1997 he released his debut album Poems and Other Things , where Chris Cheek and Roberta Piket participated. He also wrote film music . With Steve Lehman , Mary Halvorson and James Carney he recorded Duoalben. In the field of jazz, he was involved 1995-2012 to 31 recording sessions, except those named with Joel Harrison , Dan Willis and Rez Abbasi.